A truly beautiful soul with some wonderfully simple, yet effective energy medicine techniques to help get one through life. I have felt this quite strongly within my own body. Fear, anger, sadness etc. have an effect of ‘twisting in’ upon oneself (what I imagine ‘torsion fields’ do); as if you are closing and retracting in upon yourself. Your body, mind and emotions stiffen and become really dense. Imagine all the oxygen and nutrients this effect denies for your body. On the other hand, love, joy and peace have the opposite effect, creating a sense of ‘expansion’ – as if your heart is spreading out in all directions. The body then becomes ‘light’ – less dense. Is this ‘expansion’ of the heart the thing which creates angels wings? Do you want to be a prisoner or a conqueror? This article titled ‘Overcoming Moods’ by Paramahansa Yogananda can be found here. There is no doubt the writings of this man have helped and inspired me greatly. I hope they inspire and help someone out there as well…. You can conquer your moods, no matter how terrible they seem. Make up your mind that you are not going to be moody anymore; and if a mood comes in spite of your resolve, analyze the cause that brought it on, and do something constructive about it. Don’t go on doing things in a state of indifference, if that is your attitude, for indifference is the worst of all moods. At such times, remind yourself that you are not your own creator; God created you, and He is running this universe for you. Whatever your work, do it enthusiastically, for Him. Busy yourself in creative activities, for He has given you infinite power. How dare you make yourself a mental failure by indulgence in the intoxicant of moodiness! Free yourself from these devastating mental states. They are the real brakes on the wheels of your progress. Until you release them, you cannot move on. Every morning, remind yourself that you are God’s child, and that no matter what the difficulties, you have the power to overcome them. Heir to the cosmic power of Spirit, you are more dangerous than danger! …. A truly inspirational, poet video featuring child prodigy artist Akiane Kramarik, painting a most remarkable image of the Christ. An inspiration to believers, and non-believers alike. See more of my art at lil’ Biscuit. The challenge, and gift, of the Tesla Metamorphosis practitioner is to judge nothing…extending their loving heart to all…even the most unlovable (in self and others). Here is where a radical shift in consciousness can take place…raising our vibration and causing us to take on a higher frequency, or, state of awareness/consciousness. The lightness of being that can be felt when one chooses to do this is remarkably liberating. This may be a task we all need to do, to enable ourselves to move out of the quandary we have been in for so long. (In steps a voice of doubt)…. How could I not judge all the bad stuff? How could I forgive, and ‘be’ forgiven for all the wrongs that have been committed? We need to be punished! We don’t deserve the privilege of not being held accountable. Here might be where we get stuck. If only we could ‘see’ (have a birds eye view) of the cause of things…the natural course of events which lead up to things happening…things said…things done; “Ah, yes”…we might think…”Now I can understand why that happened! It wasn’t ‘because’ of me, it was because of …..” Knowing there is rhyme and reason to things, we wouldn’t need to take things personally; we wouldn’t need to accept the burden of being solely responsible (or making others solely responsible) for all the “bad” stuff. We are not sole perpetrators…we are participants…acting from a natural instinct and drive to do so. Are we going to blame ourselves, or others, for having been unconscious players? When we don’t realise the karmic wheel we are stuck on – the cause and effect nature of the natural world – well, we continue the motions, the “eye for an eye” thing. When we finally see, and realise, this automatic pilot cycle we are stuck on, we can begin to imagine a way out of it; and so glad will be our heart. A great teacher taught us to ‘turn the other cheek’. Being no impractical suggestion, this was a practical ‘instruction’ on how to negate this perpetuating karmic cycle…how to neutralise it affects. Back to the part about forgiving self; once we realise the cycle we are trapped in, we can slowly (or quickly) begin to develop mercy and compassion for ourselves. Recognizing our own mishaps of judgment and action in others will allow us to begin to have mercy and compassion for ourselves. We will be able to give mercy; and, you know how it goes….what you ‘give’ you shall receive. Just know this is a very tough and stubborn ‘skin’ we are trying to shed…our old habits; and let us not put ourselves down for occasionally slipping up. Instead, know this is a hard task, and expect to occasionally fall backwards. But, let us persevere…let us ‘carry our crosses’, and, keep our heads pointed in the direction we want to go. When tempted to become angry (for example), rather than slipping into the whole drama and fiasco of it (and ultimate guilt/karma) reason with yourself – ask: ‘why’ am I feeling angry? Bring awareness to the situation – minus any need to judge it – remembering it is a natural response…an ‘effect’ of a cause…an equal and opposite reaction to a thing. Light on the situation allows you navigate through it. You can decide…”O.k., where ‘do’ I want to go with this? Actually, I don’t ‘want’ to be angry; so, I will let it go”. Please note that my writing is based on my own research, creative contemplation’s, and, intuitive understanding. I write with a certain conviction which often bemuses me – I wonder ‘where’ these insights come from, and, is there any merit to them. I do not claim to know or present “fact” or “truth”. Tesla’s Healing ‘frequencies’ of light? During the Tesla Metamorphosis workshops I undertook in March this year, Tesla Waves were referred to as healing “frequencies” of light. Yet, Tesla Waves – also known scientifically as ‘Scalar Waves’ – are non-hertzian waves of light, meaning – they are ‘without’ frequency*. (‘Waves’ are the distance between two peaks of a light wave). So, how can they be referred to as “frequencies”…I wondered. *‘Frequency’ means: the number of cycles of a wave to pass some point in a second – known as cycles per second, or, Hertz. Longer light waves have a slower rate of vibration – and form the colours red, orange, and yellow. Shorter light waves have a faster rate of vibration – and form the colours blue, indigo, and violet. Green – associated with the heart chakra – is the ‘in-between’–the ‘mediator’–between the lower and upper “headquarters” of our chakra/endocrine system, so to speak. Please note: The following is based on my own intuitive reasoning and speculation. I do not claim to know or present fact or truth. So (I reasoned), Tesla Waves – being: ‘without’ frequency – will take on the frequency of the receiver!? Tesla Waves are believed to be sourced directly from the ‘Active Ether’ (i.e. The Field/Zero Point Energy). They conform to the receivers’ heart, and, intention – taking on the resonance of that intention. If ones intention is to receive healing from a Higher Source/Intelligence – then, these light waves will ‘become’ a healing light source. They are the building matter sourced directly from the ether/the field. They contain the full intelligence of the universe –the creator –and we choose how we’re going to play with them. The source of living structures—physical, and mental. Tesla Waves are “without frequency” because – they take on the frequency with which they are received. If we allow ourselves to be ‘tuned into’ God/Source, we allow the information contained within this vibration/consciousness to work through us – clearing out that which does not serve us, and ‘resetting’ natural, harmonic order. With our crown chakra open and aligned to Creative Source, the Tesla Waves – entering through the crown chakra (pituitary gland) – take on the frequency of the crown chakra – resulting in that vibrant ‘violet’ colour seen in PIP camera images. It is this pure, unaltered light/consciousness – unaltered by the controlling doubts and fears we choose to shed by accepting this form of healing – which creates the ‘healing frequencies’. Standing alone, Tesla Waves can be regarded as: ‘particles of pure potential’ – and, ‘become’ what we imprint upon them with our beliefs and desires. The ecstasy that will occur when we realize that ‘we’ are the Creators; or, at least portions of it. Staying open to a Higher Source/God/Love, minus crippling fear and doubt, will allow this Light/Consciousness to continue working through us – bringing us the healing we want and need. The question now is – ‘How ‘do’ we get rid of crippling fear and doubt’? I’ll save that for another post. What is the significance of the violet colour? Signifies attunement to the Divine. Complete acceptance of the ways of the Creative force – ‘Not my will but Thine’. 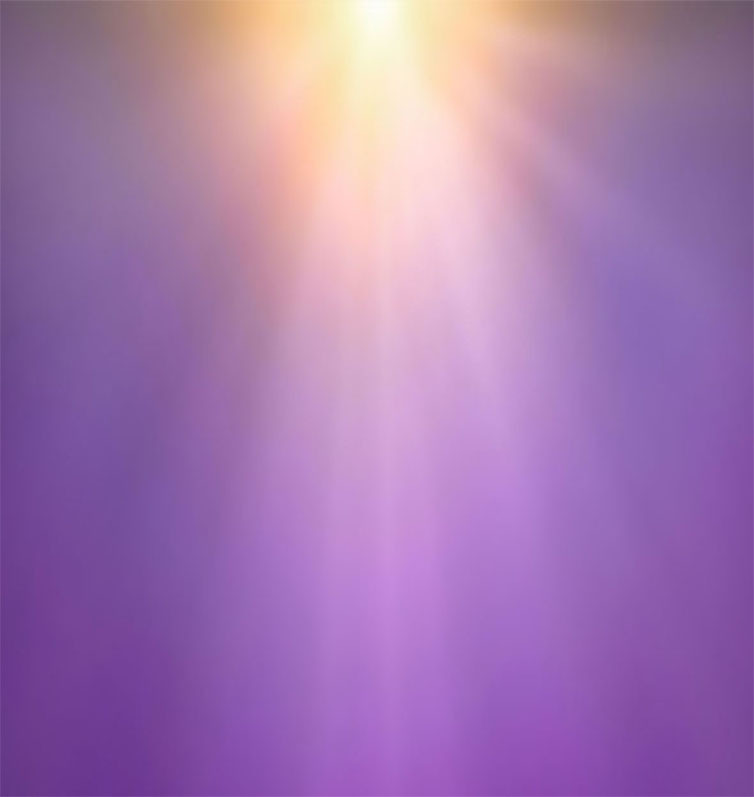 As the crown centre opens and becomes violet > golden > white – all seven spiritual centres return to their original purposes, recharged and regenerated. This really is more than a simple, little statement! It could change the chemistry of your brain – bringing you healing you could never before have imagined. For information about Ho’oponopono, click here.